A 72yr old lady comes to see you complaining of mild fatigue, and occasional shortness of breath. She finds her house-work a little more tiring than she used too. She laughs as she tells you that her family say she just "does too much" and "doesn't recognise that she needs to slow down". She thinks they may be right, but just wanted your opinion and a check up. She denies any chest discomfort during these episodes. She has no past history of, or risk factors for, IHD other than her long standing hypertension. Her BP has been well controlled for many years on Atenolol 50mg. On the basis of more recent evidence, and hypertension guidelines, you discussed with her the pros and cons of changing this at her last medication review, but she was keen not to 'meddle', as it suited her well. Respiratory and Cardiovascular examination are normal. In particular, she has no creps, no ankle swelling, and no murmurs. She is of slim build and looks clinically well. You decide to check her ECG and BNP. Other bloods (including FBC, U&E's, eGFR and TFTs) were all done within the last 3months and were all normal. Q1. What do you think of the machine analysis "Normal Sinus Rhythm"? Remember the definition of Normal Sinus Rhythm ? The PR interval is constant, and < 0.02 sec - no. Q2. What do you think of the machine analysis "Anteroseptal infarct, probably old" ? Less certain here. It's the Q-waves in V1 and V2 that the machine is getting excited about. Not very convincing, but possible I suppose. (see Pathological Q waves). I suspect these are non-pathological Q waves, but we could do we a closer look, to exclude a small R wave preceding them, like the one we start to see in V3. Q3. Is there any voltage criteria LVH? No. None convincing. See Voltage criteria for LVH if you need refreshing. Q4. What is the PR interval? Aha. Now we're talking. For ease of measurement, look on the long lead two and choose a complex where the start point of the p-wave sits just nicely on a 5mm marking. 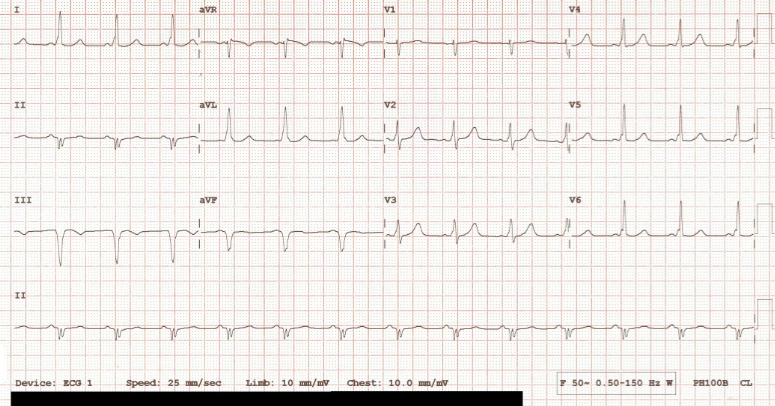 On this ECG that's the P wave before either the 4th (or 8th) QRS complex. It looks about 12 small squares to me? That is 12 x0.04sec = 0.48 seconds. (Normal range is 3-5 small squares, or 0.11- 0.20 seconds). The PR interval is long. This is First Degree Heart Block. Q5. What action might you take next? Most of these causes can be excluded in the history above, apart from medication (and AV nodal disease). This lady needs her beta-blocker stopping. If she needs an alternative treatment for BP control, then treat in accordance with current Hypertension guidelines (e.g. Consider a non-rate-limiting calcium antagonist, such as Amlodipine, or an ACE). 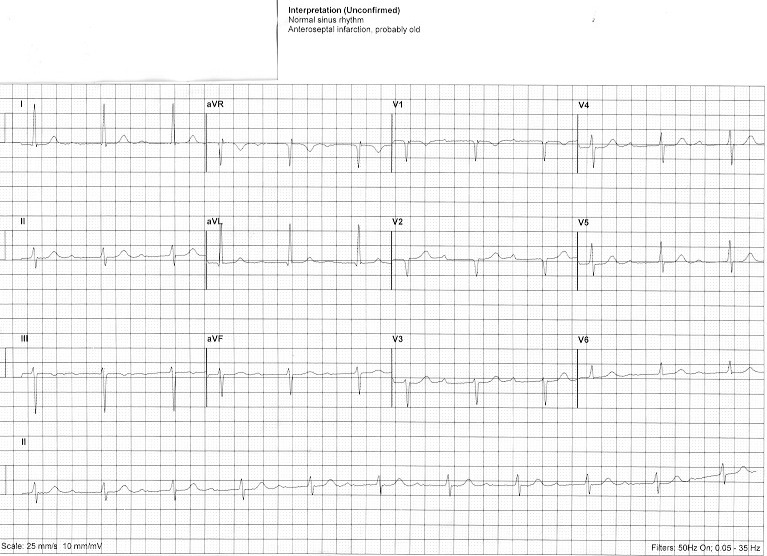 I suspect that a repeat ECG, just one week after stopping her beta-blocker, will be completely normal. You may just have prevented her from progressing to a more serious conductive system defect. In summary, I think her presenting symptoms are probably incidental. You may just want to exclude angina, by more detailed history taking and finding out more about her exercise tolerance and it's predictability, but her family are probably right in their assessment! First degree heart block is usually completely asymptomatic. However, her presentation has at least uncovered a potential future problem, which you can now pre-empt, and address. The wife of this 48yr old man, called the paramedics when she witnessed his collapse at home. The paramedics arrived within minutes, noted his complete loss of cardiac output, initiated CPR and gave 2 shocks, with return of spontaneous circulation. Q1. What is the pre-shock rhythm? He was taken directly to the catheter labs at the local hospital, but his coronary arteries were entirely normal. As his GP, you hear about his admission. His three small children attend the local school with your own. He's not someone you see very often, so you check his notes. According to your records, he was previously fit and well, other than one mention of palpitations a few years ago. He had only mentioned these in passing. They did not worry him and rarely caused him anything more than a trivial and transient discomfort. You had advised him about caffeine intake, and work stress, but neither you nor he felt they warranted further investigation. You had advised him to contact you again, if they became more frequent, or troublesome. Q3. What might you be thinking about now? Q4. What is the PR interval? is it normal? Q5. Is the morphology of the QRS complex normal? Q6. What is the QT interval? is it normal? Q1. 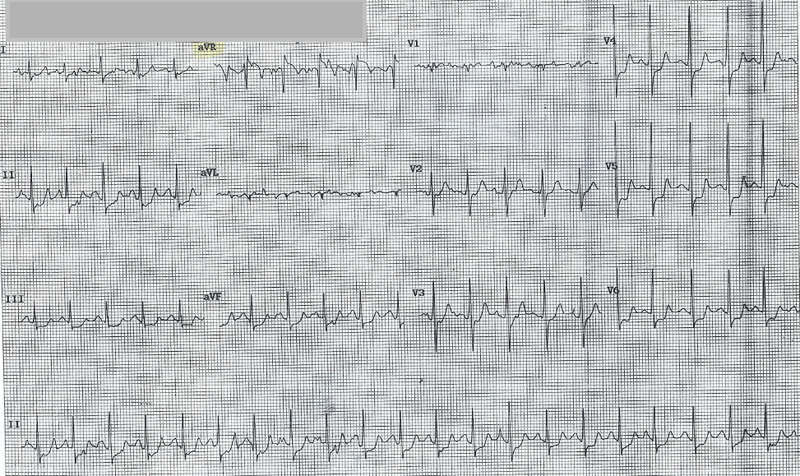 The pre-shock strip shows completely disorganised, chaotic ventricular activity. This is Ventricular Fibrillation (VF). This is a life threatening arrhythmia, which is inexcusable to miss. Hope you got it! Q2. 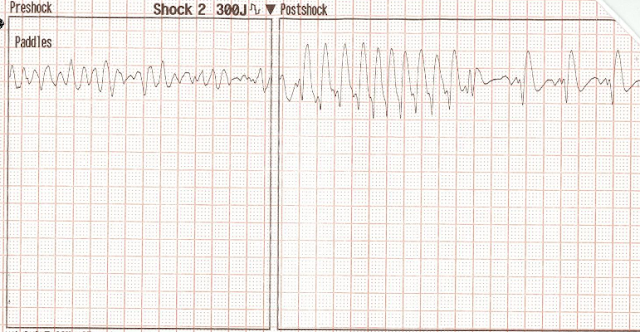 The first rhythm on the post-shock strip shows an irregular Broad Complex Tachycardia (BCT), at a very rapid rate (300 bpm). All the complexes look similar, a bit like monomorphic Ventricular Tachycardia (VT) - but unlike VT, they are irregular (zoom in and map out, to confirm this, if you're in any doubt). So far so good. I think this is a reasonable level of interpretation for most of us. But, there's more detail to follow, for the advanced enthusiasts! The second rhythm looks like a possible return to sinus rhythm (alternatively, this could be a CPR artefact - we'd need a longer strip to be sure). Q3. What might you be thinking about? Well, apart from your defence union... ;o You might be wondering about that history of palpitations. Was it significant? We start thinking about things like Wolf Parkinson White syndrome, The hereditary channelopathies, long QT/Brugada etc. etc. To exclude these disorders, we need to consider the PR interval, the QRS morphology and the QT interval. You can chose any lead you like when it comes to measuring waves and intervals - so always just plump for the one with the clearest, most well-defined complexes. 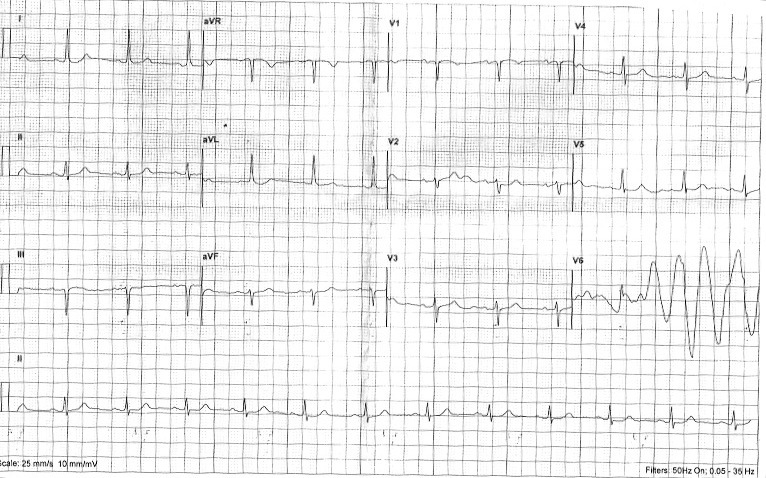 For this reason, in this ECG, let's study Lead I.
Q4. The PR interval on this ECG is short at around 2 small squares (0.08 seconds), slurring directly on to a stepped upsloping R wave. Q5. As already eluded to, The R wave is 'stepped' - or slurred - with a slightly broad base. Given that the QRS complex represents ventricular depolarisation, and this is a very rapid process (thanks to the ventricular conduction systems, the Bundle of His and Purkinje fibres) the R wave should be likewise, a rapid, pretty much vertical, upstroke (or downstroke depending on the lead). 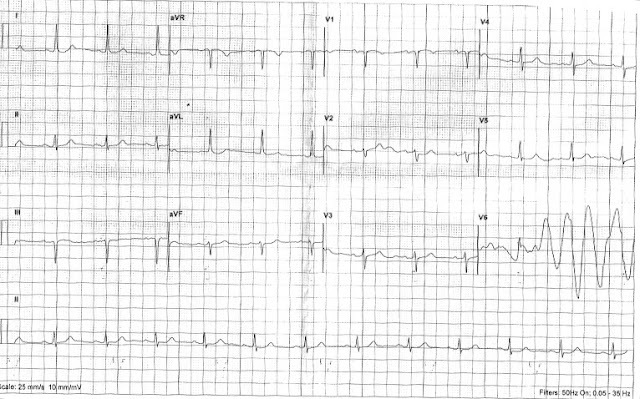 This ECG shows beautiful pre-excited Delta waves indicative of Wolff Parkinson White. Q6. Again using Lead 1 for calculation purposes, the QT interval is normal at 10 small squares, or 0.40 seconds. (Normal range 9-11 small squares, or 0.36 - 0.44 seconds). This can be most easily measured using the very first complex in lead I as it sits perfectly on the grid lines! Tip: Always look out for complexes sitting on the grid lines - to make measuring easy on yourself. For more information of WPW, it's presentation and management, refer back to the previous post by clicking on the link. But remember - Delta waves alone, do not constitute WPW syndrome - that diagnosis relies on associated symptoms of syncope or palpitations. Now here's the tricky bit, for advanced followers. This irregular BCT is a result of atrial fibrillation being conducted direct to the ventricles by way of an accessory pathway. So the VF has been shocked into pre-excited AF. Because the conduction is going the 'right' way down the accessory pathway (atria to ventricles), it's termed anterograde. (If the conduction travels from ventricles to atria it's termed retrograde). Because the accessory pathway is abnormal, it doesn't have the delaying and rate-limiting properties of the AV node that usually protect the ventricles from abnormally fast rates. In EP studies, they can stimulate VT by bombarding the ventricles with rapid impulses. 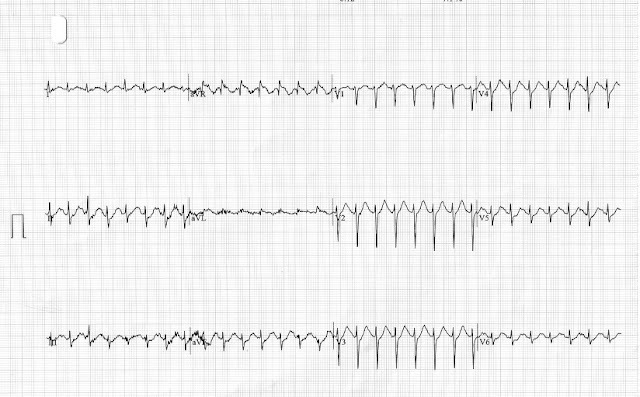 This is why the combination of WPW and AF is dangerous: the anterograde conduction down the accessory pathway can act like a natural VT stimulator. This man went on to have ablation therapy. It's really unusual to capture a shock strip like the one above, and it's certainly not something we're likely to see as GP's, but it does serve to alert and remind us, of the possible fatal complication of WPW. In this case, hindsight is a wonderful thing. But it was almost too late for the advantage-of-the-retrospectoscope in this husband and father. I'm really grateful to Mark Hammond for kindly providing, and helping talk me through, these strips. Thanks Mark! 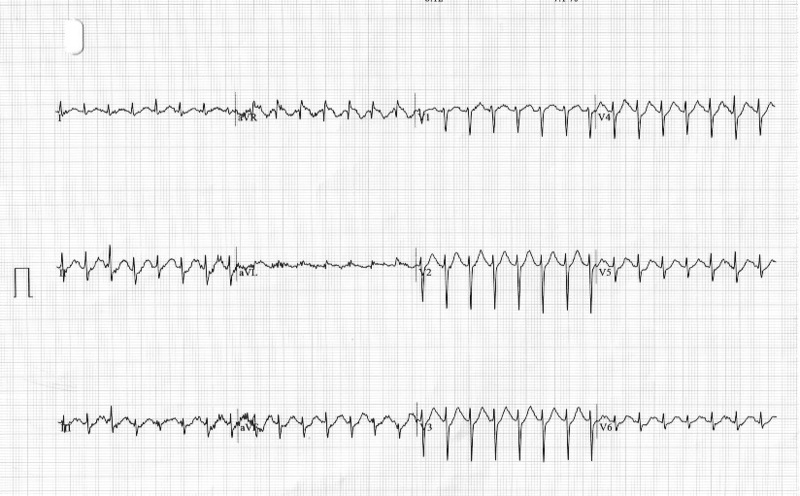 H.
The pre-shock strip shows completely disorganised, chaotic ventricular activity. This is Ventricular Fibrillation (VF). This is a life threatening arrhythmia, which is inexcusable to miss. Hope you got it! Q2. There are two post-shock rhythms. How would you describe the first? 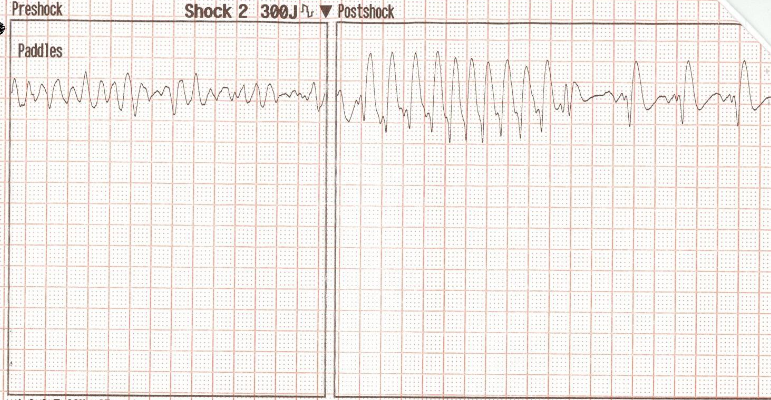 The first rhythm on the post-shock strip shows an irregular Broad Complex Tachycardia (BCT), at a very rapid rate (300 bpm). All the complexes look similar, a bit like monomorphic Ventricular Tachycardia (VT) - but unlike VT, they are irregular (zoom in and map out, to confirm this, if you're in any doubt). Q3. What possible conditions might you be thinking about now? Q4. What is the PR interval? Is it normal? (refer to Normal Values if you're unsure). I thought it might be useful to discuss the ST segment in a bit more detail. 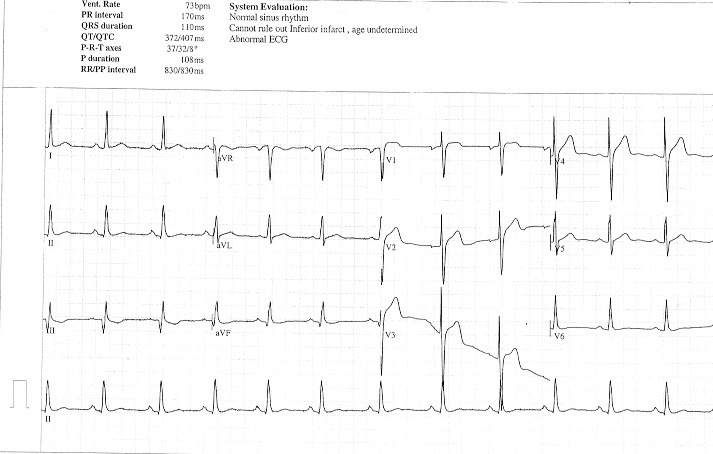 As with any other aspect of an ECG, when you come to comment on the ST segments, just describe what you see. Each of these forms should then be further described in accordance with the pattern/shape they take on. Whilst an isoelectric ST segment is usually considered the norm, it may appear slightly 'squared' off with a sharper than usual cornering effect between the baseline and the T wave. This can be an early sign of impending ischaemia, during exertion. It may also appear slightly 'slurred' or 'scooped'. This scooped pattern may sometimes appear slightly depressed (perhaps only 0.5mm - half a small square). Baseline 'slurring' of ST segments is a commonly seen normal variant in well, middle-aged women, and is a non-specific finding. These non-specific changes can make interpretation more tricky, if presenting with chest pain. It's important to comment on these variations and they need to be considered in conjunction with the history. Any ST changes occurring during an episode or chest pain, or exertion, need to be considered in terms of 'variation form the baseline'. Given this lady's non-cardiac presentation, and lack of any cardiac risk factors, I would consider these ST segments 'non-specific'. We are, hopefully, all pretty familiar with the localised convex pattern of ST elevation, which alerts us to an acute STEMI. More detailed analyses of the acute settling changes of ACS and STEMI's are not really in keeping with this Primary Care blog, and I will leave for others to discuss. All you need to do is recognise it quickly and set in motion acute management (aspirin/GTN/999) in accordance with your local Acute Chest Pain guidelines. Other forms of ST elevation can be described as non-localised, saddle-backed, notched, scooped and can be seen in pericarditis, left bundle branch block and high take off. 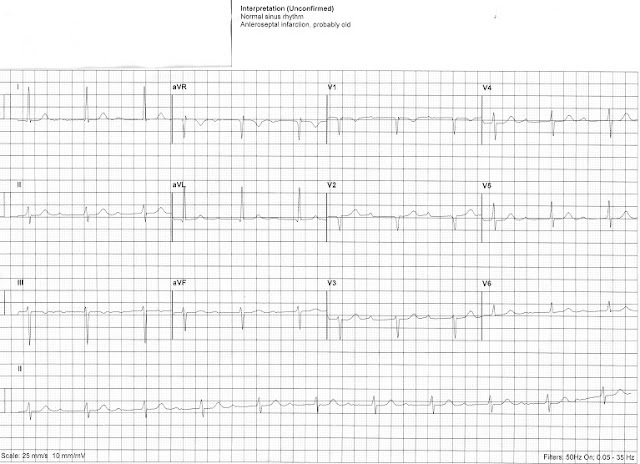 Examples of these different patterns can be seen in the July 2012's post Different Patterns of ST elevation. The latter three patterns denote increasing severity of ischaemia. These need to be considered in conjunction with history, presentation and risk factors. In an otherwise well, female patient, with non-cardiac chest pain, and no risk factors, they should probably be ignored. If in any doubt - perhaps in a patient with atypical chest pain, and risk factors, a referral to the RACPC, for consideration of CT Coronary Angiogram (CTCA) may be reassuring. In men, they are less often seen as a normal variant, and their presence should raise your suspicions. However, if seen during an episode of acute chest pain, even in women, they may be indicative of an Acute Coronary Syndrome and should be managed accordingly. See "Heart and education" 2003 article by Tom Hyde (@thecardyologist) suggesting even 0.5mm ST depression is associated with an increased 4yr mortality). Whilst this might be the very first and early sign of progressive ischaemia, it can also be a normal feature during faster pulse rates, such as seen during exercise. 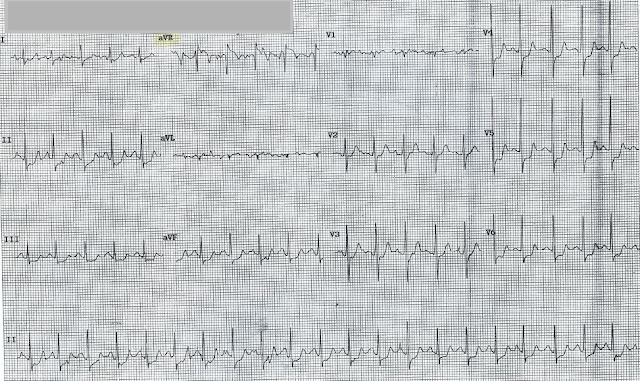 Uplsoping ST depression is often be seen during treadmill ECG's. As long as there is no progression (i.e to horizontal or downsloping ST changes) or no associated symptoms, and there is rapid resolution in the resting/recovery phase, it can usually be disregarded. This is a more significant form of ST change, indicative of ischaemia. During exercise testing it is described in terms of deviation for the baseline: "1mm of Horizontal ST depression". By definition, for Horizontal ST depression to be considered 'significant' during ETT it should be > or equal to 2mm. less than this can be commented on as "non-diagnositic ST depression". Whilst the lateral leads above show good going downsloping ST depression, the inferior leads, whilst still a little upsloping, are heading that way soon, I suspect! This is the most advanced form of ST depression, denoting marked ischaemia. ST depression will frequently progress through upsloping - horizontal - downsloping pattern during progressive ischaemia/exercise. Most ETT protocols dictate that the test should be stopped if 2mm ST depression is associated with symptoms, or >3mm ST depression occurs, even in the absence of symptoms. In advanced cases, the downsloping ST depression can eventually progress to cause a 'flipping' of the T-waves and thus T wave inversion is seen, before slowly returning back to baseline during recovery. Hope this clears up ST segments. When are the Q waves pathological? Below are another couple of examples of patients who presented with non-cardiac sounding chest pain (prolonged at rest, with no exertional component) but were referred to RACPC because the ECG machine digital analysis reported 'possible infarct'. Unless of course, the clinical history or examination warranted referral (see post: The NICE Chest pain guidelines) , none of the three ECG's above show significant abnormality, which is alone worthy of a cardiology referral. 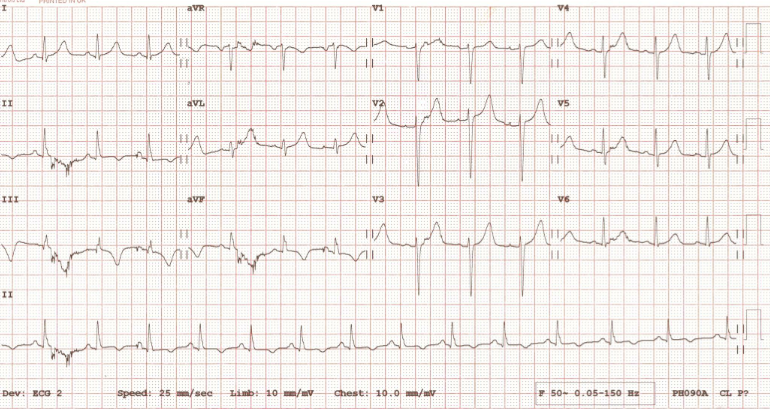 A pathological Q wave is a result of absence of electrical activity, following myocardial damage. They generally take several hours to develop after an MI, and usually persist indefinitely. The exception to this is if seen during an acute MI, but the myocardial tissue is reperfused early by Primary PCI (Percutaneous Coronary Intervention). The myocardial tissue can then recover, and the pathological Q waves disappear. Any Q wave in leads V1- V3 with a duration of >0.02seconds is likely to be pathological. Many 'apparently' pathological Q-waves, often infact have a tiny R-deflection preceeding them - this can be so small it may need searching closely for. (seen in example 1 above). 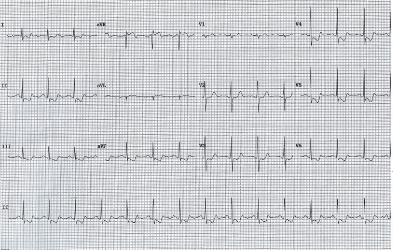 A pathological Q wave may also be broad, in appearance, but again, must be seen in two contiguous leads. There are many more detailed criteria suggested for Pathological Q waves, if you are interested, search for either the ESC classification; the Minnesota Code Classification System; or the Novacode system. The above rules, get me by!